3 DPs and 3 different types of flower. I decided to make a cupcake card this week as I have my CraftROBO back and I wanted to play. I made the template myself and I really like the shape. My image is from The Town Scrapper and the name is "Made with Love Lola" (hence the cupcake card) she is coloured with Copics and Promarkers. My 3 DPs are from The Creative Cottage, who have a new store. My 3 different flowers are punched from the papers, a rose I opened slightly and a charm. The frame for Lola was cut with a large Nellie oval die. All the edges were shaded with distessed inks. Hop over to the challenge and join in it's great fun. To see the wonderful creations by the other posse members go to the buttons under my header and click. You won't be disappointed they are a very talented bunch. i just can say........ yummi!!!!!! hahahaha... you lucky one with your craft robo!!!! Beautiful card! 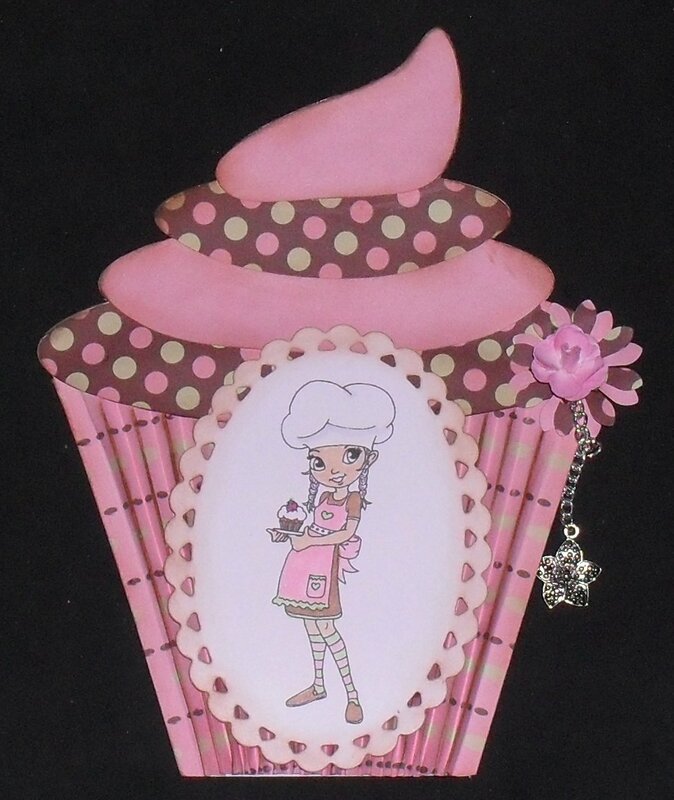 I love the cupcake and pink/brown is one of my favorite color combos. Hiya Poppet. This is absolutely delightful. How lovely to be able to create that shape. I cant take my eyes off it, just so beautiful. I love the little flower with the charm hanging and your image is just so perfect. Fantastic job. Happy crafting. What a fun shaped card! Thanks so much for playing the DTC this week! Hi Poppet this card is fantastic hunni I luuurrrvvvveeee the shape its awesome!!! Hope you had a great weekend. Such a cute cupcake card! Perfect card for the Digital Tuesday for the girls challenge! Thanks for joining us! This looks good enough to eat! real yummy scrummy. Thanks for joining us at AG. I love that card!! Looks soo yummy! Great idea!